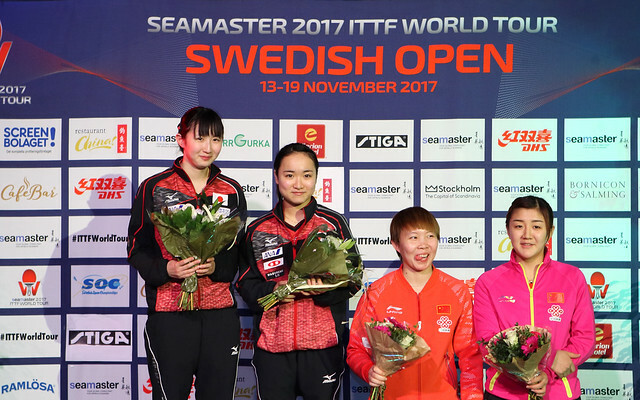 The three day qualification tournament completed successfully, followed by as shock opening round win; on the late afternoon of Friday 17th November, Nigeria’s Quadri Aruna continued to both stun and entertain the crowd in Stockholm’s Eriksdalshallen at the Seamaster 2017 ITTF World Tour Swedish Open. Having the previous evening ousted Hong Kong’s Wong Chin Ting, the no.5 seed (11-7, 11-4, 11-8, 6-11, 2-11, 11-6), he gave a repeat performance to end the hopes of Portugal’s Marcos Freitas, the no.12 seed, totally against expectations the 30 year old from Lagos won in four straight games (11-6, 11-4, 13-11, 12-10). It was a stunning performance with one point in particular quite simply from a different planet; the point in the fourth game that took the score from 9-all to 10-9 in the Nigerian’s favour. Marcos Freitas was in total control, he played fast and wide to Quadri Aruna’s forehand. At full stretch the man from Lagos made contact with the ball, he must have been using a telescopic handled racket; he finished lying prone, flat on the floor. The ball floated back landing on to the Marcos Freitas side of the table. Play the return 100 times maybe 1,000 and Marcos Freitas would have put the ball on the table; today it was the 1,001st, he put on the floor! It was the point we will all remember in an outstanding performance. Success for Quadri Aruna, a quarter-final place booked. Now a prodigious challenge awaits; in the top half of the draw he is the only player remaining not representing the People’s Republic of China. Furthermore, his opponent in the round of the last eight is Fan Zhendong, the top seed. The quarter-finals and semi-finals will be played on Saturday 18th November.